Property of Hasbro? No way, Ted wants to be recognized as a person! He forms his own thoughts and opinions and has the ability to become emotional, so how can the government label him as property? Ted just wants the simple things in life anyway, like working at the local grocery store, starting a family with Tami-Lynn, and of course hanging out with his BFF John. Use this Ted 2 Apron Kit to prove that Ted is not just a magical teddy bear...he's a real person! Ted loves football, and you probably love football AND Ted so we think this Ted 2 Football Jersey costume is possibly the most perfect costume for you this Halloween. It looks just like the foul-mouthed yet cuddly bear from the hit films and even has Ted's favorite number right on the front. 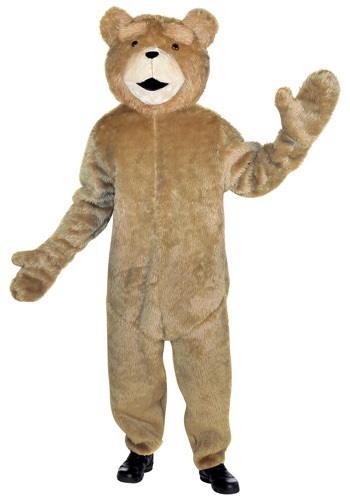 Get ready to party next game day with this Ted costume! Ted needs to keep his super soft fur dry when it's raining cats and dogs. Hey, at least it's not raining bears out there! Of course, Ted prefers being cuddled up on the couch with his bestie John singing the thunder buddies song when it's pouring outside, however sometimes Ted is forced to be outside during thunderstorms. 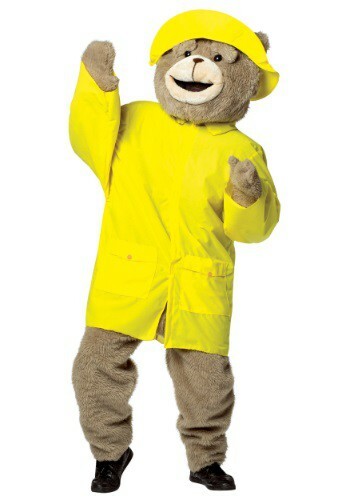 He wears this Ted 2 Rain Slicker Kit to shield his fluffy body from the rain! Sure, you COULD just go in a regular Ted costume, but if you like to get a little green now and then, why not just go in this Rasta Ted 2 costume? You don't want to be just like all the other bears, you need your own expressive flair! Particularly some flair that represents your Rastafarian principles. So, go in our licensed Ted 2 Rasta costume and you'll be ready to party, and possibly to do some Reggae karaoke. Don't let that fuzzy fur and cute smile fool you! Ted's a bear who's not afraid to do things that your mother would not approve of. Of course, that's why we think the Seth MacFarlane character would be a blast to hang with. This Ted 2 Scuba Kit helps you look like the bear from the movie, so you can get into character! Once you have it on, you just have to find a Tami-Lynn of your own to snorkel with. "Is it still hump day if you did nothing all week? "Sometimes when you make a wish it can come true and that is just what happened to young John one Christmas morning when he found that his new teddy bear could actually talk. As they grew older both John and Ted stayed friends but that started to change as soon as John and his girlfriend Lori got serious. John began to think that it was time for Ted to be on his own with his own place and Ted just wanted to keep partying. Which who can blame him? Partying is awesome! Now you can party just like the loveable, fowl mouthed bear! 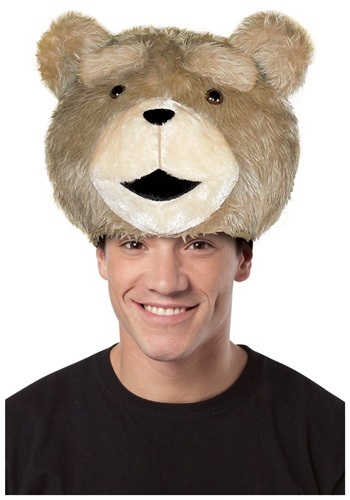 Be the foul mouthed little teddy bear from Boston with this Ted Headpiece, and see if you can find a better place to get stoned! Try to patch things up between John and Lori, and apologize for the most disgusting thing ever.